In a forthcoming Press Release we will be announcing that the NHLPA Goals & Dreams fund gave the Kawartha Komets a donation of approximately $8,000. worth of brand new hockey equipment. We received this generous gift at the end of our Inaugural Season so many of our players will start Season # 2 decked out in new gear. We are grateful to the NHLPA (National Hockey League Players Assocation) for their generosity both to the Kawartha Komets and to many other organizations in many countries around the world. 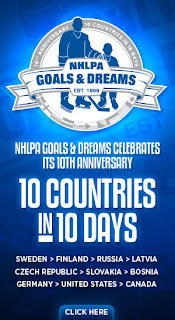 Launched in 1999 the NHLPA Goals & Dreams fund continues its commitment to aiding in the development of grassroots hockey programs around the world. Through the donation of equipment, Goals & Dreams affords children the opportunity to play hockey-- a sport that educates players in teamwork, commitment, discipline and physical fitness. Since inception, Goals & Dreams has donated more than 13,000 full sets of equipment to underprivileged children in 22 countries. Due to the players’ donations more than 50,000 children have been given opportunity to participate in the sport of hockey around the world. In the first five years of the program, the Goals & Dreams fund provided funding to arenas. During this time, 75 ice re-surfacers and more than 110 sets of boards and glass were provided to community arenas in small towns in Europe and North America. 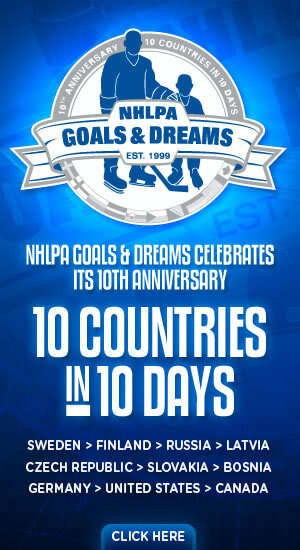 The donated funds are allocated on a pro-rated basis according to the nationalities of the NHLPA’s membership. To date, the program has donated more than $17-million to grassroots hockey programs around the world, making it the largest program of its kind!